Phuket beaches and the beaches in Thailand have gone through a number of changes and improvements, although some would disagree with the last part. As a long-term resident and provider of English language radio, Phuket Island Radio is currently updating the Phuket beaches guide and overall conditions in preparation for the 2017-18 season. The Island of Phuket may not be the cheapest destination in Thailand, but you have many stunning Phuket beaches and scenery to choose from. Every beach visitor is well taken care of. Whether you are looking for peace and privacy, romance, hustle, and bustle, or a beautiful snorkel spot, you will find it on or near Phuket. Almost every hotel offers accommodations near the legendary beaches of this wonderful Thai island. Are you looking for some specific beaches, you will find out that there are many you can choose from. Some of the Phuket Beaches are more suitable for families, and the other beaches can offer unlimited snorkelling opportunities. Below are the various beaches you can find in our Phuket Beaches 2017 -2018 Guide. If you say Phuket, many will say Patong Beach. This is the probably the most famous beach in Phuket, maybe from all of Thailand. Here it is about seeing and being seen. Patong Beach is one of the noisier Phuket Beaches you will find and experience, you cannot relax at this beach. It is non-stop morning to night, Jet’s Ski’s, Parasailing, banana boat rides, beach vendors, massage, and just about anything else you can think of you will find right here. Patong is most popular with young people who visit the clubs along the beach and the infamous Bangla road as soon as it gets dark. You will also find families and older people on the beach. Once or twice a week there will be a massive cruise ship delivering a day trippers of the wealthy from Singapore and around the World. 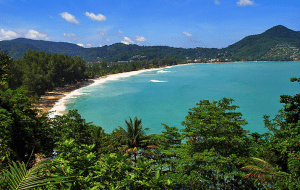 Kamala Beach, north of Patong Beach, is one of the best bases for families with children, and couples who want to enjoy a caring beach holiday. Although it is one of Phuket’s most famous beaches, there is plenty of room for laying your towel under one of the many palm trees. In recent years some of the best Hotels and resorts have established themselves in this area, take a ride along ‘Millionares’ mile and see for your self. Kamala Beach is probably one of the quieter Phuket beaches on the west coast. Banana Beach is the best for snorkelling and diving. This is one of the main reasons that visitors come to Phuket is for snorkelling. Some beaches offer easy access to particular reefs. A few miles south of Patong Beach you will find Kata Beach. A beautiful long stretch of one and a half mile long draws a multifaceted audience. Here too, you can do activities, and you can ride the jet skis, parasail or take a run on a banana boat but please check out some of the news when considering these activities. Still, the atmosphere is more relaxed and more comfortable than at Patong Beach, which makes it a bit more attractive for families. In the vicinity of Kata Beach, you will find surprisingly many beautiful and good quality restaurants. You will find Thai food western dishes and even cuisine from the far and middle East. Best beach for the family? Families who are not looking for exuberant Phuket beaches with beach parties or a massive and vibrant nightlife should check out this area of Kata. Here you will find a white sandy beach with a quiet safe sea in a beautiful bay. Most of the hotels and resorts at Kata are a short walk from the beach, making it ideal for families with children. Here you can take some activities including a long tail boat or parasailing trip. However, for the most part, this area is quiet and relaxing. 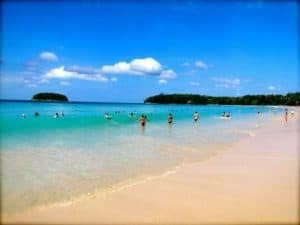 This is the recommended beaches for families with or without small children who can play in the powdery white sand or under the supervision of the parents swimming in the clear blue water. When looking for privacy and peace, the Mai Khao beach on the northwest coast of the island is the best we can think of. As part of a national park, with only a few hotels in the immediate area, Mai Khao is the best place for people that want peace and quiet. The 11-kilometer long beach (yes 11 kilometers) has coarser sand than the rest of that to rest around the beaches area. The sea is not ideal for swimming. It’s pretty deep during the monsoon season, but the area is perfect for privacy and romance. 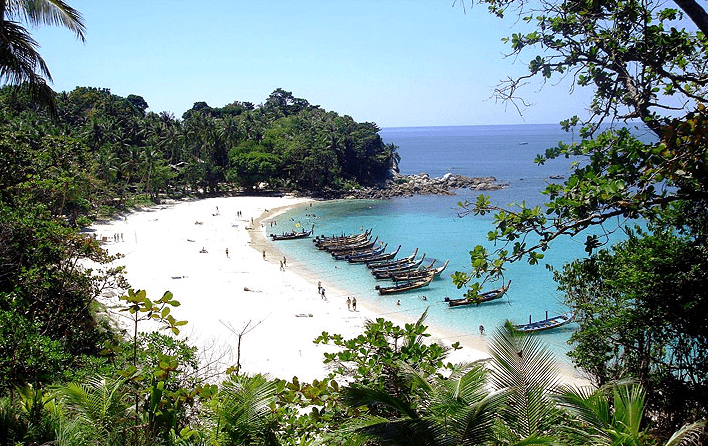 Kamala Beach, for example, is perfect for snorkelling. You must then be the northern end of the beach. From Rawai Beach in the South, you can take a boat trip to Koh Lone or Racha Island for some of the best snorkelling options in Phuket. Nai Yang Beach offers at the northern end of the beach, access to the Sirinath National Park and a protected reef for snorkelling. With so many beaches on Phuket, you can reach all sides of the Island easily and get you Phuket beach exploring done. Try to not stay in one place, but go on a discovery trip to the beach of your dreams. You will undoubtedly find your paradise. The above Phuket beaches are thus some of the most popular and famous beaches in Phuket. Phuket is blessed with over 30 sandy beaches, none of which is more beautiful than the other. Please check back as we intend updating this page in time for the 2017-18 season. Phuket Weather and Phuket Weather Forecast. Phuket Island radio on 91.5 and 102.5 FM has daily local weather updates, you can Tune on air and Online. Every month we update the outlook and what to expect. We are updating information all the time on Phuket Beaches, feel free to read, comment, like and share.